This particular South Indian breakfast dish is a game changer. Have you heard the phrase “Once you start, you can’t stop”, well I am pretty sure that phrase was invented for this mouth-watering, delectable dish that will leave you wanting more! Growing up, I was not very pious and would regularly have tantrums about having to visit our Kovil (temple), there was only one exception – when they served Pongal as part of the Prasadham (Holy offering). Then, I’d stand in queue with my Grandma for a long time just so I could get my little hands on a pottalam (parcel made out of dried Lotus leaf) of mushy Pongal and finish it off even before we left the kovil. Yum Yum!! 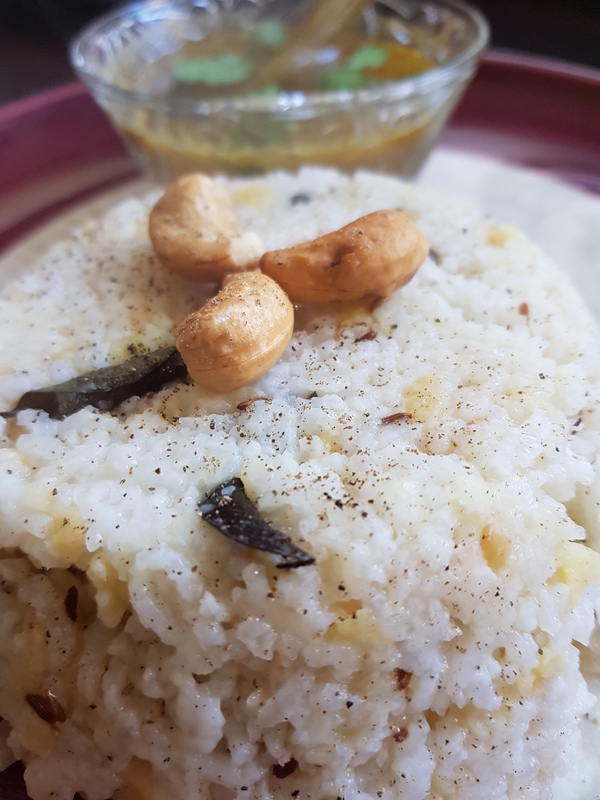 As I am sure you are aware, rice is a staple food of South India, most of our dishes involve rice in some way or another. This particular breakfast dish is no exception. With a very few ingredients, this creamy, rich and tasty dish is very simple to make – especially if you have an Instant Pot or a pressure cooker. 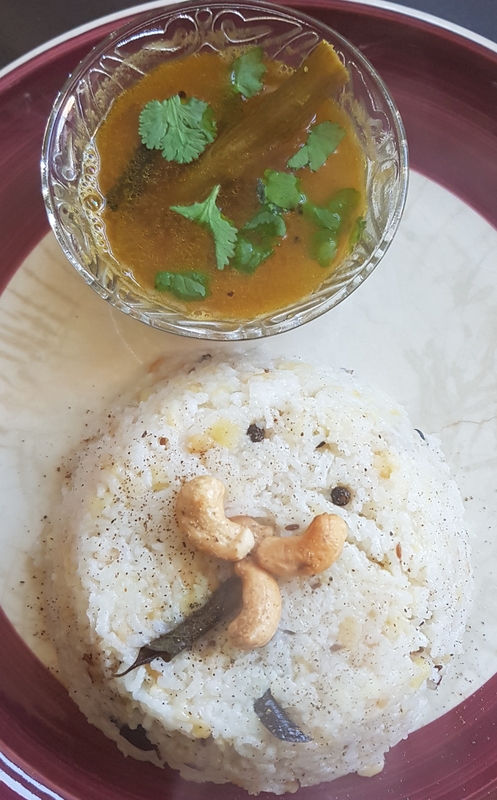 Served usually with Sambhar but when I was a kid, I remember Amma sprinkling chakkarai (sugar) on top – the salty savoury-ness of the Pongal mixed with the sweetness of the sugar is a taste that I will never ever forget! So if you are serving this to your children, have a go at sprinkling sugar on the top and see what they think. Sauté mode (press the adjust button so that it is on “Low”). Dry sauté (or you can use a little oil or ghee if you prefer) the washed rice and moong dal for about 30 seconds, keep moving it around so that the bottom doesn’t burn. Turn off sauté mode. Add the grated ginger salt and pepper. Add 4 cups water and mix well. Pop the lid on, set to sealing. Cook on high pressure on manual for 10 minutes. No pressure release. Once pressure pin has dropped, open the lid, remove the Pongal and set aside. Hit sauté mode again and add Ghee to the bottom of the pan. Add the cashews and fry for 30 seconds or until lightly red. Then add the whole peppercorns, the curry leaves and lastly the cumin seeds. Mix everything well with the Pongal and serve hot with Sambhar. Tip: if you are having a “lazy day” like I do sometimes, you can move tempering to step 1, once that’s done, add the rice, moong dal etc. and follow the recipe till the end! The flavour will still be the same just the cashews won’t be as crunchy. In the base of the pressure cooker, dry sauté (or you can use a little oil or ghee if preferred) the washed rice and moong dal for about 30 seconds, keep moving it around so that the bottom doesn’t burn. Add the grated ginger salt and pepper. Add 4 cups water and mix well. Pop the lid on and the pressure pin. Cook for four to five whistles. Add Ghee to the bottom of another pan or a tempering ladle. Add the cashews and fry for 30 seconds or until lightly red. Then add the whole peppercorns, the curry leaves and lastly the cumin seeds.